Find me a FAM tour and let me go on it. Working in tourism makes me a lucky fellow. I was one of the two people from the bureau to play host on a FAM tour through our area for travel writer Connie Reed, and we visited Asparagus Restaurant for lunch to refuel before heading out to last weekend&apos;s Pierogi Fest® (like you really need to refuel before that fest). I may not be part of any sort of chorus, but it didn&apos;t stop my taste buds from singing high praises. The Eastern Zen décor of Asparagus Restaurant provided instant serenity to us wary travelers. Owners Tammy Pham and Sam Chung have created a dynamic atmosphere fit for their Asian-fashioned cuisine. Fine dining along the South Shore never looked better. If you&apos;re looking for amazing Thai food, look no further. As soon as our group found our way to the table, we scanned the menu to silence our grumbling stomachs. Everyone knows that a proper meal begins with the appetizer. 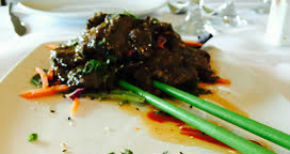 Our group took this tried-and-true notion to heart by ordering the Spicy Lemon Grass Beef and the Asparagus Crispy Rolls. A special order of Duo Cargot also made its way to our table that was spicy, sweet and swimming in coconut milk! The lemony-zest on the marinated beef held the taste of summer with each bite. That&apos;s not a dramatization. Sweetness oozed and I feared a cavity (there&apos;s your dramatization). Mixing the beef with swirls of the hot sauce helped distinguish the rich flavor of sesame seed, garlic and honey from the beef. The presentation of the dish was also something to marvel. 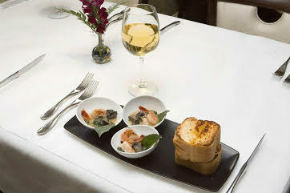 The French presentation of the dishes is clearly a signature of the owners. The Asparagus Crispy Rolls arrived with the Spicy Lemon Grass Beef and provided a much-needed crunch. The dish is a rice spring roll that cradles fresh asparagus with parmesan and bacon. The mix of flavors blend harmoniously together, and its richness comes alive with a swipe of the sweet/sour dipping sauce. Give me these over bread rolls any day. I couldn&apos;t help myself from choosing the Grilled Flank Steak for my entrée. The dish is a perfect ten on presentation alone. 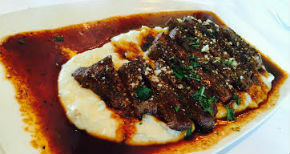 This is a classic meat and potato offering, and it comes as a 14-ounce steak laid atop a bed of pureed spuds. Brave souls can opt to top their order with grilled mushroom and onion, but I was craven. I went American and kept the steak barren. I stand by my choice because it was delicious. How can one find room after such a spread? When dessert comes, it&apos;s best to act like a Nike Swoosh - just do it. A monstrous slice of vanilla cheesecake and a decadent bowl of bread pudding magically arrived at the perfect time. Both desserts were courtesies of Tammy Pham. The cheesecake is delectable and the cranberry sauce ties it all together better than laces on shoes. 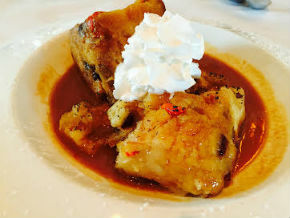 The bread pudding was steamy-sweetness and came resting in a pool caramel. Both desserts didn&apos;t last on the table for long. This was one of the best lunches I&apos;ve ever had the pleasure of enjoying in Northwest Indiana. The city of Merrillville finds itself host to a restaurant gem. If you&apos;re looking to have a dinner for two, or a reunion for 20, make your reservation now. You won&apos;t find yourself with regrets... at least on the food level. Tyler is a former Digital Content Specialist for the South Shore CVA, managing our social media. Find out what's happening around the South Shore by following us on facebook, twitter and instagram.